Bailey's Front Porch -- burley, latakia, perique, va. Blended by the great Bob Runowski, and probably my favorite right now. The same components as Epiphany (another Runowski blend), so if you want to like Epiphany but don't like the top flavor, try some Bailey's. Super Balkan -- burley, latakia, oriental, perique, va. Sounds like an overwhelming mix, but works well for me. To me, no one component overwhelms the others; at times I get sweetness from the virginia, sour from the orientals, spicy from the perique, and smoky from the latakia. Odessa -- burley, latakia, oriental, perique. A little more oriental-forward than the others, kind of a sweet and sour mix. Red Odessa replaces the burley with virginia, so it's sweeter but not as strong. Crowley's Best -- burley, latakia, perique. Suprisingly sweet for a blend without virginia, with some spice from the perique. Not a complex flavor bomb, but I like it. I have also tried Atlas Balkan and Bayou Night, and while I like these, I don't buy pounds for the cellar. There are still more C&D burley/latakia blends I have not yet tried, but I'm happy with those I have right now. I should also mention a couple of top-flavored blends: Pasha's Dream (burley, latakia, oriental, va) and Snug Harbor (burley, latakia, oriental, perique); both have a lightly sweet top flavor. If you like Lane HGL or Sutliff Aromatic English but wish they had a bit more nicotine, you might like Pasha's Dream or Snug Harbor. I like both, but not enough to add them to the daily rotation. I will mention Morley's Best and Big n' Burley, but while I love both I don't really think they fit in this category. If you like burley and want a little latakia with it, both are definitely worth trying. I know some other blenders make this type of blend, but I am a C&D fan, so I stick to their blends. What others have you tried? That's a good list. Many of those C&D blends I have tried and enjoyed. Don't know if this meets your criteria for a "Dirty English" but lately I've been enjoying Cuban Mixture from L.J. Peretti. It is listed among their Burley blends and it has Latakia. Like some of those C&D blends mentioned it also has other tobaccos: Kentucky, Maryland, Oriental/Turkish, Virginia, Cavendish and Cigar Leaf. Heh. Guess about all it is missing is Perique. I am a a big fan of Morley's Best and Big-n-Burley. There is always Billy Budd too. GLP Sextant. It has an over ripe flavor to it probably from the rum. Latikia, Virginia, and Kentucky. I’ll smoke it at the end of the day and it’s still pretty strong, but I like it. Watch City Americano. It replaced C&D Epiphany in my rotation a few years ago. It wasn't worlds better but I preferred it enough to make the change. Will have to try Bailey's Front Porch. Chances are I'd like it too if it's just Epiphany minus the topping. I didn’t like Epiphany but did like Bailey’s. Super Balkan was really good too. I’d completely forgotten about it. Morleys Best is very burley forward with latakia. I really like it. C&D Americana is an American English with a decent burley presence. I recommend it as well. 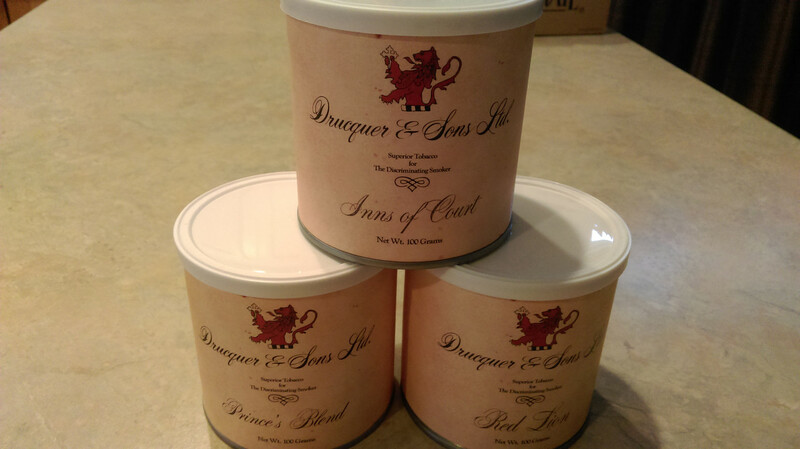 If you're looking for more componenets, check out Drucquer & Sons Inns of Court. Thanks to this thread I'm revisiting Bailey's for the first time in several months. I'm liking it more than I recalled. +1 @dmkerr - WC Americano is my favorite American English. Burley and Latakia is a sin. All y'all are gon burn. Oh except D-9575, that's totally awesome. I apologize if I gave the wrong impression about Bailey's Front Porch and Epiphany -- while they use the same component tobaccos, I don't think Bailey's is just 'Epiphany minus the topping'. I simply meant that people who don't like the topping on Epiphany might want to try Bailey's instead. I guess I should clarify my post too. I was just stating that I did like one and not the other. Although it’s been years since I tried it, so maybe I should revisit it just for the hell of it. My apology is that I forgot Peretti's D-9575 is my other favorite. I don't think I have a third favorite but let's see what folks post. Here's a trio I am enjoying a lot. I picked up a couple of tins of Daughters & Ryan - Raccoon's Friend. I finished the first one but I'm in no hurry to open the second tin. Burley, latakia and virginia. I guess I'm not that big of a fan of burley. Bumping this because I got a few new C&D blends to try. First up is Golden Ash -- burley, latakia, and virginia. I would not really call this a 'dirty english' -- it's more like a 'dirty VaBur'. A solid burley backbone, with some sweetness from the virginia, and just a hint of latakia smokiness. I think this would be an interesting blend in a blind review -- I can imagine some people missing the latakia, but I think it's there if you look for it. It sort of reminds me of a more well-behaved version of Morley's Best (I love Morley's Best, but I would not call it subtle). If you like Morley's Best (or don't like it but want to try something similar) you might like Golden Ash. TR says this blend contains cavendish, but both SP and the C&D website do not include cavendish in the ingredient list. For some reason the name always put me off of that one. I know that seems silly but I never ordered any because of it. I’ll have to throw an ounce on my next order now.